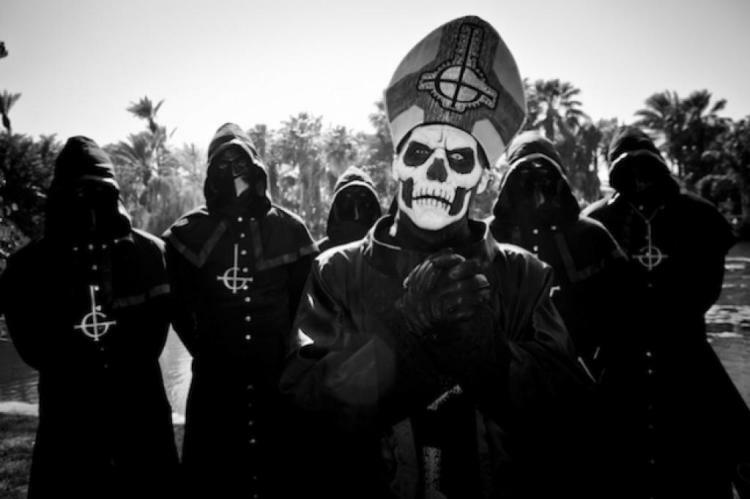 One of the nameless ghouls from Ghost was recently interviewed, you can read some excerpts below. About the title of Ghost's new album, "Meliora": "I think that the super-correct translation from Latin is 'for the pursuit of something better,' or 'all things better,' or something like that. It is actually more thematical with the lyrical content and the backdrop that we wanted to paint in front of which we're playing these songs, basically, which was supposed to be, or is supposed to be, a super-urban, metropolitan, pre-apocalyptic, dystopic futuristic thing. The title is more implying, ironically, this zenith that we think that we have reached. We're always building higher, and we're always getting a little bit faster, and everybody keeps earning a little bit more money, and everybody gets a little bit taller and a little bit tighter and a little bit… It's a constant improvement that we're hysterically trying to achieve." About Ghost's constantly evolving image and lyrical content: "Some of these things have been with us for many years, just because… Not only was it intended, just from a fan point of view, that we wanted to… for lack of a better way of saying it, to be a sort of an Iron Maiden-esque band in the sense that we wanted to revamp our schtick every time that we make a record, basically, just in order to keep it fresh and interesting, so that we could go through eras. And also, that was definitely a necessity, just because we are, also for lack of a better word, a gimmicky band. Like, aesthetically, we cannot live off, or feed off, our actual story the way that a more biographical band can, so we have to tell a story, basically. And what better way is there than to revamp into different eras."